Giving a diagnosis of amyotrophic lateral sclerosis to a patient is akin to handing out a death certificate. However, not all patients presenting with the classical dysphagia, wasting, and weakness may have motor neuron diseases. In these cases, it is extremely important not to miss little cues which can suggest an alternative diagnosis and in many cases a lease of life in terms of a treatment option. In this review, we consider some clinical scenarios that can present with the same symptom complex as diseases involving motor neurons but have a different anatomical or etiopathological basis and in many cases even a therapeutic option. Background: As per the current recommendations, carotid interventional procedures (carotid endarterectomy/carotid artery stenting) are considered superior to medical management in reducing the stroke recurrence in patients with symptomatic extracranial internal carotid artery (ICA) stenosis. Objective: The objective of this study is to compare the best medical management with carotid interventional procedures in the prevention of stroke recurrence in the patients with symptomatic extracranial ICA stenosis. Materials and Methods: This was a parallel, prospective, two-arm, open-label, observational study. Participants were selected consecutively and prospectively among patients from Outpatient and Inpatient Departments of Neurology at Nizam's Institute of Medical Sciences, Hyderabad, Telangana, India. The study period was from January 2012 to December 2017. 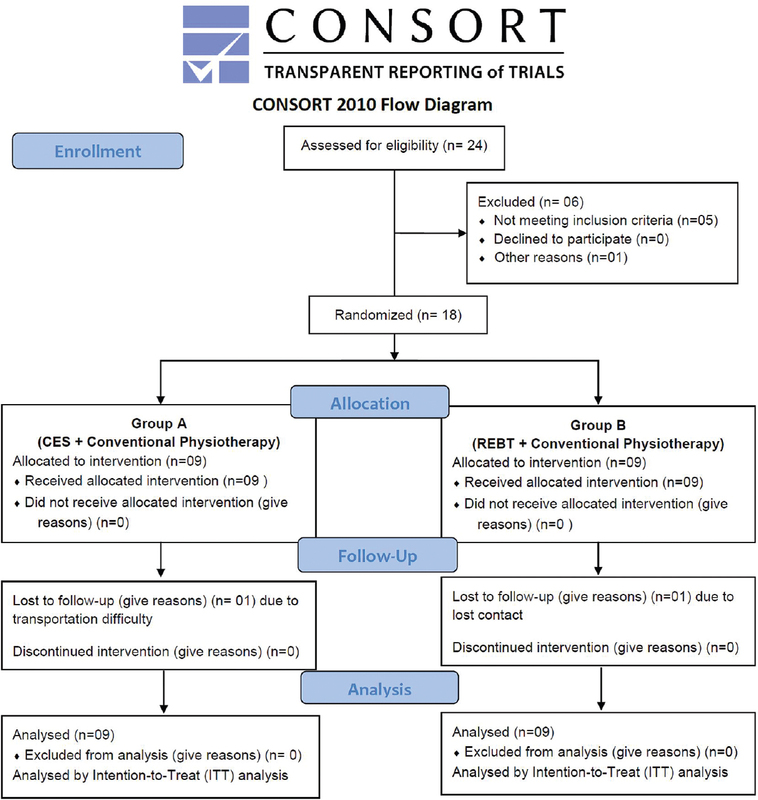 Results: Of 150 patients with symptomatic extracranial ICA stenosis of ≥50%, 100 preferred best medical management (m = 75, f = 25) and 50 (m = 37, f = 13) opted for carotid intervention. The mean age of the patient cohort was 59.8 ± 12.7. Follow-up was done at regular intervals from 3 months to 1 year. In the medical group, the recurrence occurred in 10 patients; 4 (40%) within 6 months, 5 (50%) within 6–12 months, and 1 (10%) after 1 year. In the intervention group, the recurrence occurred in 6 patients; 5 (83%) within the first 6 months and 1 (17%) within 6–12 months. Conclusions: Overall, there was no statistically significant difference in the rate of recurrence between the best medical management and the carotid interventional procedures. Introduction: A study of stroke among young adults and children has recently become a subject of interest. This is because it has a major impact on the individual and society. Studies of stroke in young can lead to therapeutical results affecting both short- and long-term outcomes. Methods: This paper is based on a hospital-based retrospective study, of stroke in young, for a duration of 1 year. Results: The study revealed stroke in young in 31.38% of all strokes, with cerebral infarction in 50.66%, followed by intracerebral hemorrhage in 41.33%, subarachnoid hemorrhage in 4.66%, and cerebral venous thrombosis in 3.33%. The most common presenting symptom was hemiparesis. The most prevalent risk factor for stroke in young was alcohol consumption, followed by traditional risk factors such as hypertension and smoking. Diabetes was detected less in our study. Conclusion: Although traditional risk factors are associated with stroke in young, unfavorable behavioral pattern such as alcohol abuse may cause and promote development stroke in young. Background: Stroke survivors suffer from significant neuropsychiatric disturbances and these disturbances act as barrier in the motor recovery. Medication is the common treatment but it has adverse effects. Hence, there is a need to find out effective treatments with or without minimal side effects for gross motor recovery of the patient. Objectives: Cranial electrical stimulation (CES) and rational emotive behavior therapy (REBT) are used as treatment approaches for depression, anxiety, stress, and irrational beliefs in the general population. In the present study, the efficacy of two psycho-therapeutic modalities (CES and REBT) along with conventional physiotherapy management was evaluated on psychological illness, motor recovery, and quality of life among chronic stroke (CS) survivors. Materials and Methods: A total of 18 patients with CS who scored >10 on Beck Depression Inventory Scale, scored >23 on Mini–Mental state examination scale, and having stroke of duration >6 months–2 years were included in the study. They were divided into two groups, A and B. Group A received CES while Group B received REBT. Both the interventions were given 5 days in a week for 4 weeks. Conventional physiotherapy for 30 min was added to both groups as common intervention. Depression, Anxiety, Stress scale (DASS-42), Pittsburgh Sleep Quality Index (PSQI), and Shortened General Attitude and Belief Scale (SGABS) were used for measuring depression, anxiety, and stress, sleep, attitude and beliefs, respectively, 4 weeks postintervention. Results: Patients with CS in Group A demonstrated significant improvement, P< 0.05, in Depression, Anxiety, Stress scale-24, PSQI, and MSSI when compared to those of Group B. Conclusion: CES has the potential to improve psychological illness such as depression, anxiety, stress, attitudes, belief, and thereby quality of life among CS survivors than REBT. Context: Intracranial atherosclerosis is a common cause of stroke in India. Transcranial Doppler (TCD) provides a noninvasive way to study basal intracranial blood vessels. The Oxfordshire Community Stroke Project (OCSP) classification is a simple clinical stroke classification system that has prognostic significance and has been associated with size and location of the infarct. Aim: This study was undertaken to identify patterns of TCD abnormalities in our stroke population particularly in relation to the OCSP classification. Setting and Design: A cross-sectional study was conducted at a tertiary care center in South India. Methods: Recent nondisabling ischemic stroke patients were studied. TCD was used to insonate bilateral middle cerebral, bilateral anterior cerebral, bilateral vertebral, and basilar arteries. Mean flow velocity was used to define normal or abnormal flow as per standard criteria. Statistical Methods: Association between abnormal flow velocities and OCSP classification was studied using Chi-square tests. Univariate and multivariate analysis was performed to determine factors associated with abnormal flow velocities. Results: Of the 59 participants studied, 42 (71%; 95% confidence interval [CI]: 57.3-84.7%) had abnormal flow velocities in one or more vessels and this was significantly associated with smoking (odds ratio = 5; 95% CI: 1.2–21.8). All abnormal flow velocities were blunted flow velocities. 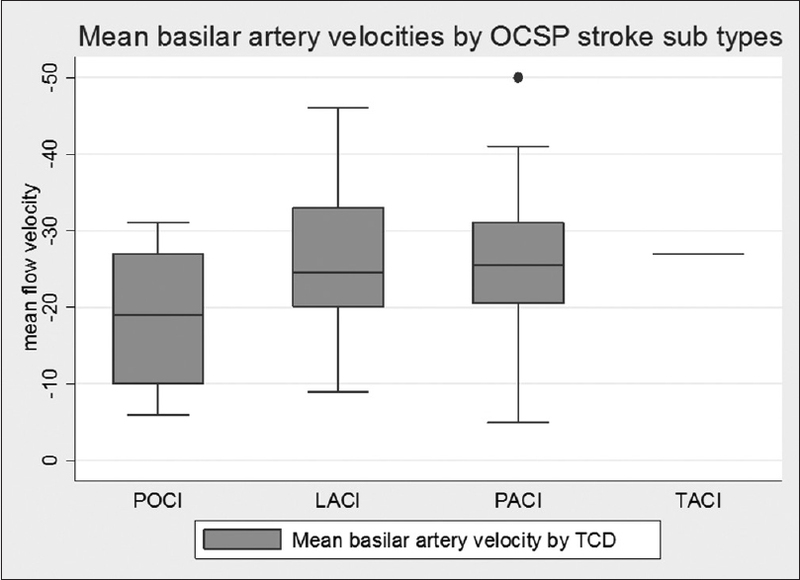 Anterior circulation flow velocity abnormalities were seen among all OCSP stroke subtypes, but posterior circulation flow abnormalities were associated with posterior circulation infarcts (P = 0.03). Conclusion: Intracranial flow velocity abnormalities are frequent among Indian stroke population. Further studies are needed to characterize these abnormalities fully. Background: It is important to know whether or not the stroke risk factors and etiologies of patients with multiple acute infarcts are different to those of patients with a single acute infarct. Aim: The frequency of multiple acute infarct was investigated in ischemic stroke patients and a comparison was made of the characteristics of stroke patients with and without multiple acute infarct. 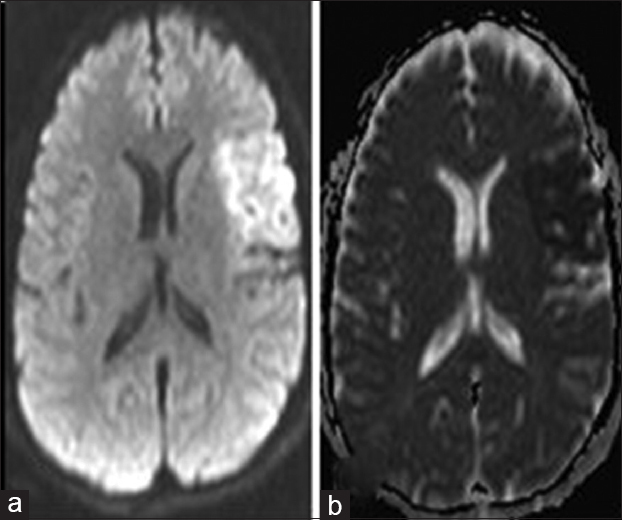 Patients and Methods: We reviewed the clinical records of 988 ischemic stroke patients who were admitted within 1 week of the onset of stroke and diffusion-weighted imaging (DWI) was performed on first presentation. The clinical characteristics, laboratory, and imaging results were noted from the patient records. According to the DWI findings, the patients were separated into three groups as those with a single acute infarct in a single vascular territory (SI group), those with multiple acute infarcts in a single vascular territory (SMI group) and those with multiple acute infarcts in multiple vascular (MMI group) territories. 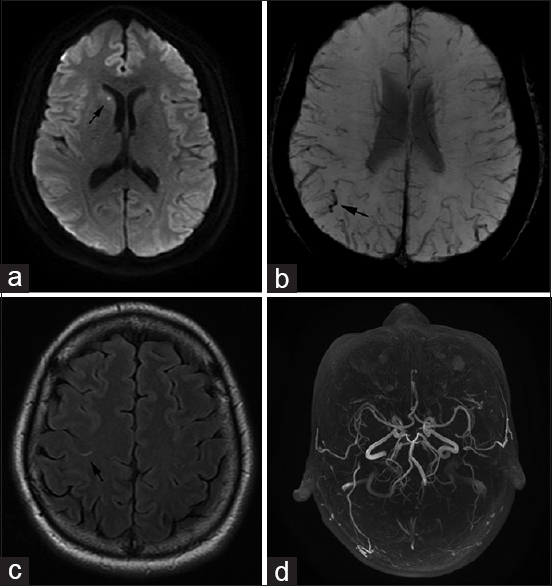 The frequency of multiple acute infarcts was investigated, and a comparison was made of the characteristics of stroke patients with and without multiple acute infarcts. Results: The SMI group included 119 (12%) patients and the MMI group 126 (12.8%). The most common mechanisms of multiple acute infarcts are large artery atherosclerosis and cardiac origin emboli. Moreover, the risk factors most determined were hypertension, diabetes mellitus, and hyperlipidemia in the MMI group. Conclusion: No difference was determined between the groups in respect of stroke etiology and risk factors. Introduction: Cerebral venous sinus thrombosis (CVST) is an unusual cause of stroke with potentially serious consequences. This study was designed to investigate the clinical and neuroimaging features in patients with CVST and to analyze the predictors of brain parenchymal lesions. Materials and Methods: A retrospective study of 181 patients with CVST was conducted in a tertiary care hospital. Results: Of 181 patients (age range 14–96 years, mean age: 34.64 ± 14.66 years), 121 were female (66.9%). Most of the patients were in their third decade of life. 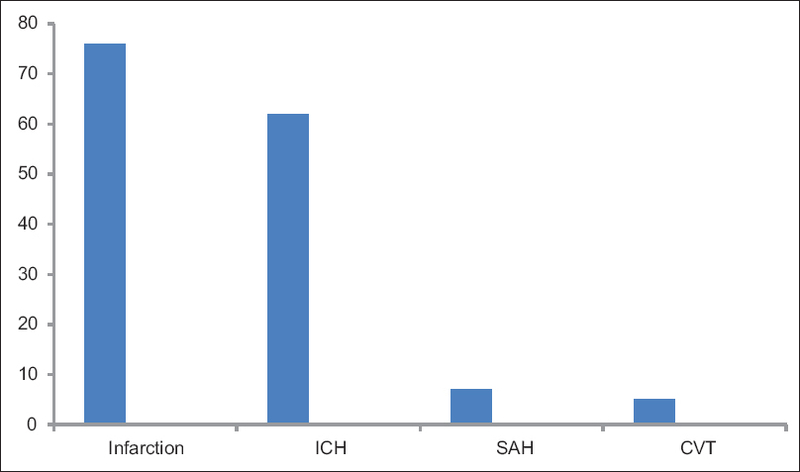 Headache (47.51%) was the most common clinical presentation followed by seizures (24.31%). Transverse sinus (TS) (77.9%) was the most common site of venous sinus thrombosis. 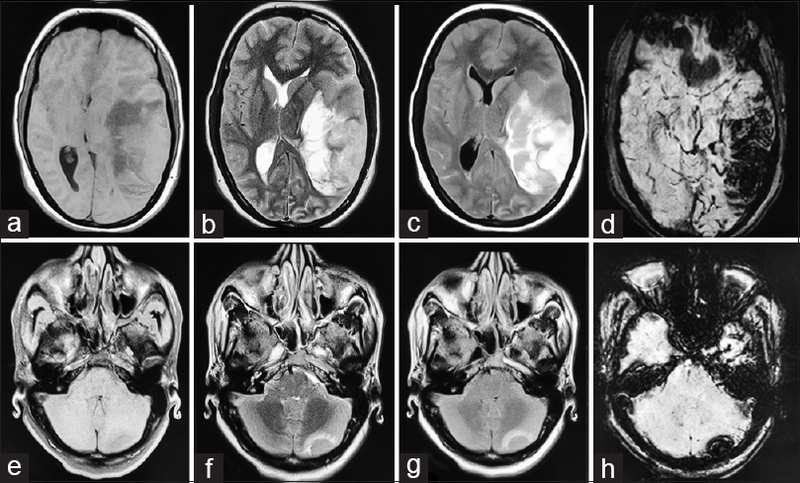 Brain parenchymal lesions were present in 63%, and each patient had subarachnoid and intraventricular hemorrhage. 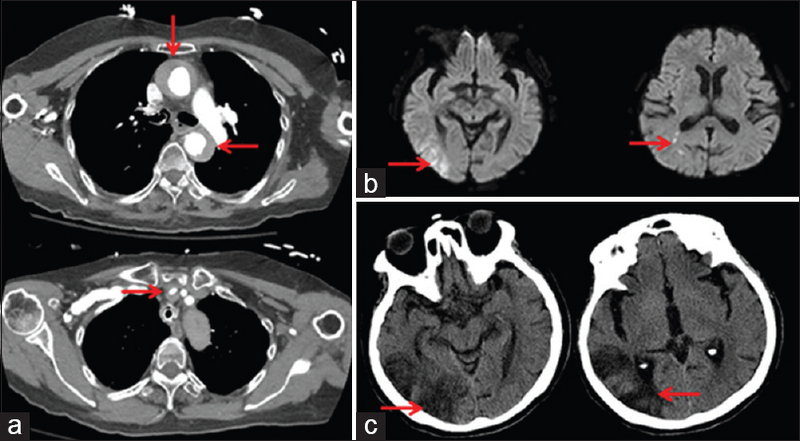 Hemorrhagic venous infarct was the most common brain parenchymal lesion (37.57%). Frontal region (25.4%) was the most common site of brain parenchymal lesions followed by frontoparietal region (21.9%). Women were more likely to have brain parenchymal lesions (72.4%, P= 0.034). Headache was the most common clinical presentation in patients without brain parenchymal lesions while seizures with brain parenchymal lesions. Straight sinus thrombosis was more likely to be associated with brain parenchymal lesions (P = 0.009). Conclusion: CVST presents in young and more commonly in females. TS was the most common site of venous sinus thrombosis. Female gender, seizures, altered sensorium and focal neurological deficit at presentation, and straight sinus thrombosis were more likely associated with the presence of brain parenchymal lesions. Aim: Limited data regarding stroke subtypes exist from South Asian countries. The aim of the study was to determine the pattern of ischemic stroke subtypes and their associated risk factors, in a 10-year long hospital-based registry in the South Indian city of Hyderabad. Materials and Methods: The Hyderabad stroke registry systematically collected clinical, radiological, and laboratory data of fully investigated consecutive stroke patients and studied pattern of ischemic stroke subtypes and their risk factor association. 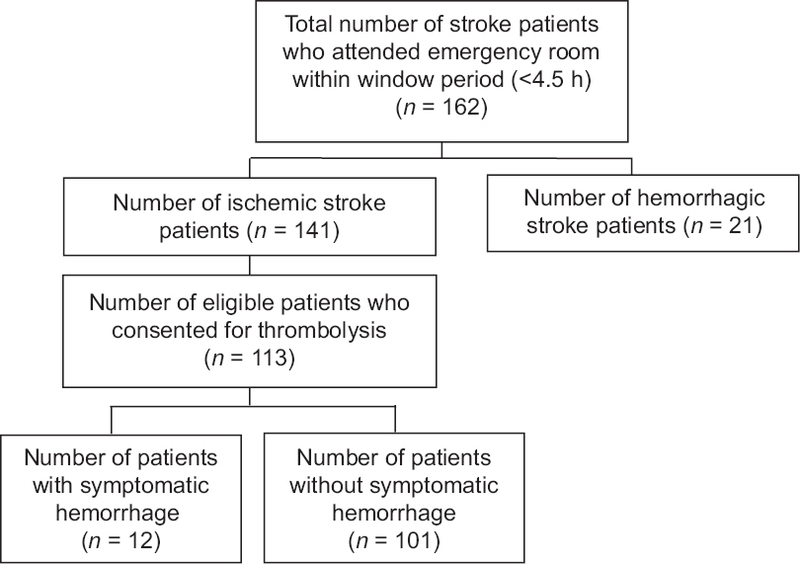 Results: The cohort comprised of 2642 patients: 2072 (78.4%) were ischemic and 570 (21.6%) were hemorrhagic strokes. 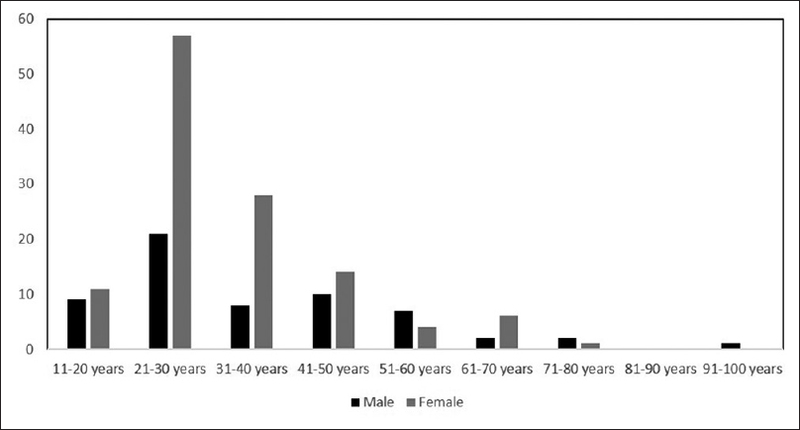 In the ischemic stroke cohort, the mean age was 54.1 years and 1622 (78.3%) were men. The most common ischemic stroke subtype was large artery atherosclerosis (LAA) comprising 37.6% (n = 779), followed by small vessel occlusion comprising 19.9% (n = 413) and cardioembolism 11% (n = 228). Stroke of other determined etiologies constituted 4.2% (n = 86) and stroke of undetermined etiology was observed in 27.3%. Among patients with LAA, 610 (78.3%) patients had intracranial and 169 (21.7%) had extracranial disease as the underlying mechanism. Risk factor profile demonstrated that hyperlipidemia was significantly associated with LAA and ischemic heart disease with cardioembolic strokes. Conclusions: The study reveals a distinct pattern of ischemic stroke subtypes in the Indian context that has overlapping features of registries from West and East Asian countries. Both large artery and small vessel diseases are substantially represented with a predominance of intracranial atherosclerosis. The study results have significant implications for developing preventive and management strategies for stroke care and research in India. Background: Symptomatic Intracerebral hemorrhage (sICH) is a serious complication of recombinant tissue-plasminogen activator (rt-PA) therapy for acute ischemic stroke (AIS). Objective: To estimate the prevalence and predictors of sICH in patients after receiving IV rt-PA for AIS. 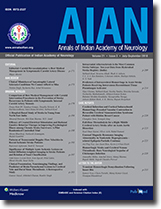 Material and Methods: Consecutive patients of AIS thrombolysed between January 2010 and June 2016 in a University hospital in Hyderabad (India) were studied prospectively for sICH and it's various variables compared with the control group without sICH to determine any sigificantant difference. Results: Out of 113 patients , sICH was detected in 12 (10.61%) whose mean age(58±12.0 years) and gender ratio ( 2:1 ) was not statistically significant from controls. In s ICH group mean NIHSS score was 16.53± 5.81 vs 10.19± 5.06 in controls (p<0.001), gap between stroke onset and thrombolysis was 227.50±46.15 min vs 178.50± 69.20 min in controls(p=0.018).At presentation mean blood sugar was 208.75±90.97 mg/dl in sICH group vs 146.83±70.21 mg/dl in controls (p=0.002). Prior diabetes was in 7(53.30%) vs 23 (22.8%) in controls (p= 0.014)and hypertension in 11 (91.7%) vs (56(55.4%) in controls (p= 0.026) The mortality in sICH was 7 (58.30%)vs 4 (4.94%) in controls (p<.0.001). At 3 months mean mRS ofsICH patients was 5.57± 0.54 vs 2.17± 1.69 in controls (p<.05). Conclusion: High NIHSS score, increased stroke onset to thrombolysis time , high blood sugar at presentation ,prior diabetes and hypertension increase the chances of sICH. None of these contraindicate thrombolysing strokes but should caution the physician. Thunderclap headaches, stroke, seizures, and cortical subarachnoid hemorrhage can all reveal reversible cerebral vasoconstriction syndrome (RCVS). Most parenchymal brain lesions occur simultaneously and sequentially with cerebral vasoconstriction in RCVS patients. Therefore, it is not easy to suspect RCVS in patients with only parenchymal brain lesions without vasoconstriction even if they present with a typical thunderclap headache. Furthermore, RCVS should be differentiated from central nervous system vasculitis. However, it is especially difficult to distinguish RCVS from the cerebral involvement of multisystem vasculitis when there is a positive result in the serologic test for autoantibodies. We report a case of RCVS with hidden breast cancer in which ischemic stroke and cortical subarachnoid hemorrhage were observed earlier than vasoconstriction, and there were positive autoantibodies. Intravenous recombinant tissue plasminogen activator (IV r-tpa) is the standard of care for patients suffering from neurological deficits due to an acute ischemic stroke within 4.5 hours in the absence of intracranial hemorrhage. We report a case of a patient with an acute right middle cerebral artery stroke due to an acute aortic dissection (Stanford Type A) who was treated with full dose IV r-tpa resulting in a good outcome. Epilepsia partialis continua (EPC) is a rare epileptic syndrome, presenting as continuous focal motor seizures for a period of minutes, hours, or days. EPC may develop in patients with cerebral cortical lesions and occasionally may develop in patients with metabolic disorders, such as nonketotic hyperglycemia (NKH). 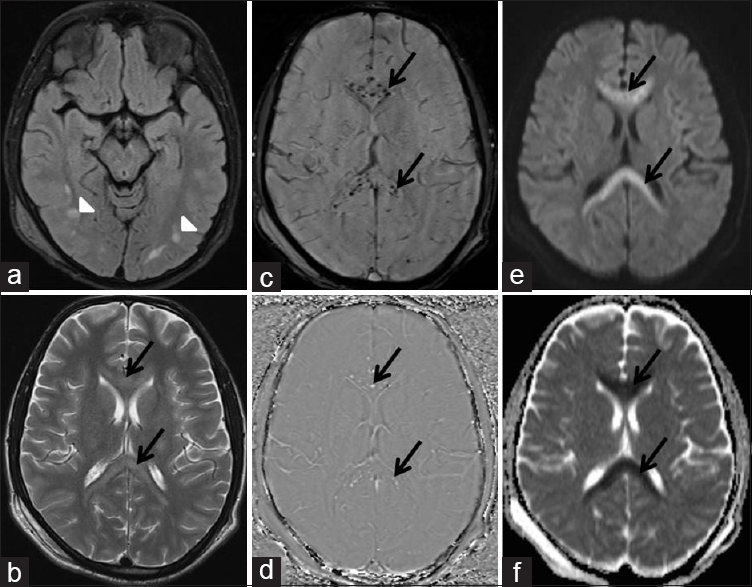 Here, we report a case of EPC following NKH, showing an unusual magnetic resonance imaging (MRI) finding of concurrent hypointensity on susceptibility-weighted image (SWI) and T2-weighted image (T2WI) with leptomeningeal and cortical enhancement, which have never been reported. A 68-year-old woman presented to our emergency department with a 3-day history of involuntary repeated contraction of the right side of the face and upper limb. Laboratory data revealed NKH of diabetes mellitus. 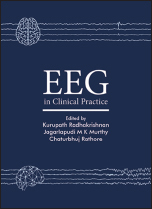 Electroencephalography (EEG) was unremarkable. Brain MRI revealed focal cortical and leptomeningeal enhancement together with subcortical T2 shortening and SWI hypointensity of the left frontal operculum. She responded well for hyperglycemia and antiepileptic drug therapy. Follow-up brain MRI performed 1 week later showed complete resolution of the abnormal signal and enhancement in the same region. Although EPC caused by NKH occurs rarely, it may result in an MRI abnormality of subcortical hypointensity on SWI and T2WI with leptomeningeal and cortical enhancement, which may be misinterpreted as other brain pathologies. Rapidly recognition is important because timely treatment with hydration and correction of hyperglycemia can lead to better outcome. We recommend such cases of metabolic disorder (such as hyperglycemia) for early consideration, particularly in the elderly. Chickenpox (varicella) is primarily a disease of childhood which occurs due to infection with varicella-zoster virus (VZV). Primary VZV infection is rare in adults due to exposure in early childhood in our country. In adults, it is associated with some serious systemic and neurological complications which can follow both primary infection and reactivation of VZV. Neurological sequelae caused by primary VZV infection are rare and include encephalitis, aseptic meningitis, myelitis, acute cerebellar ataxia, Reye syndrome, Ramsay Hunt syndrome, and rarely stroke and cerebral venous thrombosis (CVT). VZV infection of cerebral vessels produces vasculopathy and hypercoagulable state, leading to complications such as stroke and CVT. We hereby report cases of two immunocompetent young adults who developed acute hemorrhagic infarction in the brain and CVT following chickenpox infection.